4 August 2014 marks the 100th year since Great Britain declared war on Germany. The 1914-1918 campaign would become known as The Great War. 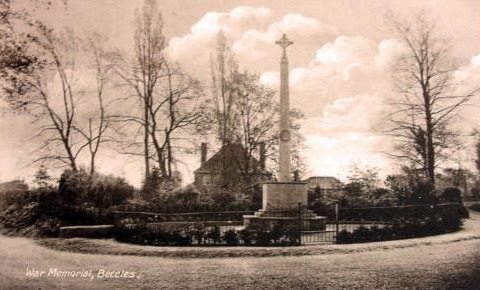 This blog post honours those Beccles men who served and died "for King and Country". The first Beccles man to fall was Pte. Frederick William Seago on August 26, 1914; the last before the signing of the Armistice was Sgnr. Harold Herbert Hadingham, who died of wounds on November 10, 1918. My great grand-uncle William Burgione Waters is also among the names listed below. "Some twenty of our heroes lie buried in Beccles, and their names are specially marked with an asterisk (*). Yearly their graves will be decorated, and their memories thus kept green. And to those who fell on the many far-off battle-fields, parents and friends and townsmen alike may feel confident that kindly and grateful hands will long tend those few feet of foreign soil that will now be for ever England. Heroes all, we owe them a debt we can never repay; for they died that we might live; and though sad hearts in Beccles to-day mourn their loss, they feel it was a sacrifice well worth the making." Those last words, written in 1920, don't particularly sit well with me. Well worth the making? I'm not convinced of that; for those loved ones and family who lost their sons, their brothers, their uncles, their cousins, their friends, their lovers, it would certainly not have been worth it. For the good of our country as a whole, dying so we might live? I am forever grateful to each and every one of these boys, and they are commemorated in this special blog post. ALDEN, Ernest, 1, Bridge-street, 7th Suffolks, L/Cpl. Killed April 10, 1917. ALEXANDER, William F., St. Anne's-rd, H.M.D. Ocean Star, 2nd Hd. R. N. R. T. Blown up Sept. 26, 1917. ALLEN, Herbert T., Ingate House, 9th Seaforth Highldrs., Capt. M.D. Killed Sept. 25, 1915. AMIS, Ernest N., 20, Old Mill-terrace, 11th Royal Fusiliers, Pte. Killed Mar. 23, 1918. ANDREWS, John, 5, Fen-lane, 7th Suffolks, Pte. Died of W.. July 22, 1915. ASHLEY, Albert E., 33, Caxton-road, 7th East Yorks, L/Sergt. M.M. Killed July 10, 1916. BAKER, George W., Stepping-hill, H.M.D. George V., Deck Hand. Blown up June 3, 1917. BALLS, Frederick L., 4, Grove Cottages, 7th Buffs, Pte. Died of W.. July 3, 1916. BALLS, William A., 4, Grove Cottages, 8th East Surreys, Pte. Killed July 1, 1916. BALLS, James, 51, Ingate, 8th East Surreys, L/Cpl. Killed May 3, 1917. BALLS, Oscar J., 4, Knights'-yard, Ravensmeer, 8th Suffolks, Pte. Killed Sept. 20, 1916. BARBER, Alfred J., 72, Denmark-road, R.E., Spr. Killed April 26, 1918. BARBER, George J., 21, Pound-road, 2nd Royal West Surreys, Pte. W. Killed Oct. 4, 1917. BARNARD, Stanley W., 46, Fair Close-road, 1/5 Suffolks, L/Cpl. Killed Nov. 2, 1917. BARNES, Albert G., 72, Blyburgate, 1st Londons, C.Q.M.S. Died of W.. June 1, 1918. BARNES, John H., 49, Station-road, 12th Rifle Brigade, Rflmn. W. Killed Feb. 12, 1916. BARTON, Frank H., 7, Queen's-road, 1st Royal Fusiliers, 2nd Lt. Killed (acc.) Nov. 5, 1918. BATES, Charles C., 8, New-road, 7th Norfolks, L/Cpl. Killed Oct. 13, 1915. BEANE, Arthur J., 53, Denmark-road, H.M.S. Vanguard, Stkr. Blown up July 9, 1917. *BETTS, Edmund C., 2, Ingate, 8th Suffolks, Sergt. W. Died of W.. Aug. 2, 1916. BICKERS, George, 31, Smallgate, R.F.A., Bomb. Died of W.. May 20, 1918. BLOOMFIELD, Harry, Under Archway, Ingate, 1/5 Gloucesters, Pte. Killed Aug. 16, 1917. BOLINGBROKE, Reginald O., 64, Northgate, Q. O. Oxf Hus., Cpl. M.D. Died of W.. Jan. 27, 1916. BOREHAM, John, 4, Bullocks-lane, 24th Royal Fusiliers, Pte. Killed April 30, 1917. BRADNUM, George, 5, Newgate, 8th East Surreys, L/Cpl. Pris. Died Nov. 15, 1916. BRANFORD, Ernest R., 12, Blyburgate, 1st Royal Fusiliers, Pte. Killed July 31, 1917. BROWN, Fred A., 18, Denmark-road, Royal Berks, L,/Cpl. Killed Aug. 22, 1917. BROWN, Frederick A., 26, Fair Close-road, Ox. and Bucks. Lt. Inf., Pte. Killed Aug. 22, 1917. BROWN, Martin W., 26, Fair Close-road, 8th Suffolks, Pte. Killed July 20, 1916. BURGESS, Thomas G., 30, Bullocks-lane, 7th Norfolks, L/Cpl. Died of W.. May 15, 1918. BYFORD, Ernest J., 15, Queen's-road, R.F.A., Gnr. Killed Aug., 1917. *CALLOW, Herbert A., 20, Ingate-road, H.M.D. George V., Engmn. Blown up June 3, 1917. CAREY, Charles, 39, Caxton-road, R.F.A., Cpl. Died Dec. 2, 1918. CASTON, Stephen, 21, Ingate, Labour Corps, Pte. Died Oct. 26, 1918. CHAMBERS, Charles T., 95, Ingate, 2nd Border Regt., Pte. 1914 Star. Killed March 13, 1916. CHANDLER, Arthur R., 62, Ingate-road, 1st Bedfords, Cpl. 1914 Star. Killed March 16, 1915. CHATTERS, Percy J., 13, St. George's road, 7th Northamptons, Pte. Killed Jan. 24, 1917. CHILVERS, Henry, 15, Old Market, 1/5 Suffolks, Pte. Killed Sept. 19, 1918. CHRISTIE, John, 8, Frederick's-road, 21st Londons, Rflmn. 1914 Star. Killed Sept. 15, 1916. CLARK, David A., 8, Station-road, 7th Suffolks, Sergt. Killed April 28, 1917. CLARKE, Frank L., 81, Denmark-road, R.E., Spr. Killed Aug. 4, 1916. CLARKE, William H., 44, Gosford-road, Dorsets, Pte. Died of W.. Sept. 28, 1915. COE, Bertram, "Butcher's Arms", London-rd, 8th East Surreys, Cpl. Died of W.. Oct. 12, 1916. *COOPER, Albion, 4, Stepping-hill, H.M.S. Vigorous, 2nd Hand. Died Mar. 24, 1919. COPEMAN, John A., 7, Gresham-road, 8th Suffolks, L/Cpl. Killed July 31, 1917. COPEMAN, Leonard F., 7, Gresham-road, East Yorkshires, Pte. Killed Nov. 13, 1916. COWLES, Albert E., 1, Gresham-road, 7th Suffolks, L/Cpl. W. Killed Mar. 26, 1918. CRISP, Arthur F., 34, Ingate-road, 2nd Last Lanes., L/Cpl. Killed Oct. 23, 1916. CRISP, Frederick W., 30, Peddars-lane, 8th Battalion King's Liverpools, Pte. Killed Sept. 11, 1918. CROFT, William C., 8, Dacre-place, R.F.A., Cpl. Fitter. Killed Aug. 12, 1917. CUSHION, Alick, 17, Alexandra- road, I/5 Suffolks, Pte. Killed Oct. 17, 1917. CUTTING, Arthur, 24, Fair Close-road, Roy. Canadian Dragoons, Sergt. Killed March 23, 1918. DAY, Ernest R., 1A, Queen's-road, 1/5 Suffolks, Pte. Died of W.. Aug. 14, 1915. DREWELL, Samuel J., Swines-green, Royal West Kents, Pte. Killed Aug. 9, 1918. DREWELL, William, House-on-the-Marsh, 1/5 Suffolks, L/Cpl. Killed Nov. 2, 1917. *DUDLEY-SCOTT, Henries K., Montagu House, R.A.F., 2nd Lt. Killed (acc.) Sept. 22, 1918. ESTOLL, Frederick J., 4, Meacham's-yard, 1st Norfolks, Pte. Killed Sept. 16, 1914. EVERSON, Arthur G., 109, Denmark-road, 1/4 Suffolks, Serge. M.M. Killed April 23, 1917. FAIRHEAD, Sidney, 12, Shaw's-yard, 7th Norfolks, Pte. 1914 Star. Killed Oct., 1917. FAIRWEATHER, Edward, 25, Smallgate, R.F.A., Q.M.S. Died of W.. July 31, 1916. *FENN, James W., 25, Ingate, Royal Fusiliers, Pte. Died Oct. 28, 1918. FIELD, William J., 80, Denmark-road, 1st Royal Fusiliers, 2nd Lt. M.C. Killed July 31, 1917. FILBY, Thomas A., 2, Ballygate, South African Infantry, Pte. W. Killed March 23, 1918. FINCH, John R., 3, Ravensmeer, 7th Suffolks, Pte. Killed March 26, 1918. FORDER, Charles H., 9, Dacre-place, 1/5 Suffolks, Pte. Killed June 29, 1917. FOSTER, Leonard J., 38, Ingate-road, 1st Northumberland Fusiliers, Pte. Killed Oct., 1914. FREEMAN, Bertie W., 6, Saltgate, Devons, Pte. Died Sept. 4, 1917. FREEMAN, Douglas A., 6, Saltgate, Suffolk Yeomanry, Tpr. Died of W.. Oct. 5, 1917. FULLER, John S., 3, Ravensmeer East, 1st Essex, Pte. Blown up on Royal Edward, Aug. 14, 1915. GARNHAM, Percival, Upper Grange-rd, 6th Gloucesters, 2nd Lt. W. Died Oct. 25, 1918. GEORGE, Arthur S., 2, Thurlow's-yard, H.M. Minesweeper Begonia, A.B. Blown up Oct. 14, 1917. GEORGE, Charles B., 2, Pleasant-place, 1st Norfolk, Pte. Killed April 23, 1917. GEORGE, William A., 28, Ingate-rd, H.M.D. George V., Deck Hand. Blown up June 3, 1917. GILL, Hubert H., 40, Ingate-road, R.A.S.C., Pte. (Butcher). Died of W.. Nov. 6, 1915. GOFFIN, George, 23, Ingate, 7th Suffolks, Pte. Died of W.. April 17, 1916. GOODERHAM, James T., 1, St. Anne's-road, 1/6 Liverpools, Sergt. Killed April 9, 1918. *GOWER, Kenneth C., 26, Blyburgate, H.M.S. General Crauford, A.B. Died Jan. 23, 1918. *GRIMMER, Charles E., 26, Northgate, R.A.S.C., Sergt. Died Aug. 20, 1917. GROOM, Walter, 4, Ravensmeer,16th Yorks. & Lanes., Pte. Died Nov. 30, 1918. *HADINGHAM, George H., 8, Fair Close-road, 2nd Norfolks, Pte. G. Died Jan. 26, 1918. HADINGHAM, Harold Herbert, Peddars-lane, R.F.A., Sgnr. G. Died Nov. 10, 1918. HALL, Herbert F., 118, Denmark-road, 135th Mach. Gun Corps, Sergt. Killed April 2, 1917. HARLEY, Omar E., 40, St. Benedict's-road, R.F.A., B.S.M. W. Died Dec. 13, 1916. HARPER, Francis T., 60, Ingate, 2nd Suffolks, Pte. Killed April 12, 1918. HARPER, Jonathan D., 60, Ingate, 1/5 Suffolks, Pte. Killed Nov. 2, 1917. HARPER, Harry, 29, Northgate,1st Suffolks, Pte. Killed (date not recorded). HARMER, Major, 52, Northgate, 2nd Norfolks, Pioneer Sergt. Pris. Died Feb. 22, 1917. HARVEY, Miles, 9, Gresham-road, Labour Corps, Pte. Died May 29, 1919. HEMBLING, Arthur W., 30, Newgate, 1st Suffolks, Pte. W. Pris. Died of W.. May 8, 1915. HOLLAND, Francis J., 131, Denmark-road, 1/4 Northants, Pte. Died of W.. Nov. 2, 1917. HONEYWOOD, Leonard, l9;Ravensmeer, 2nd Suff., Pte. 1914 Star. W. Killed Jan. 22, 1916. HOOK, George H., 2, Stone-yard, 1st Suffolks, Pte. Killed May 8, 1915. HOWARD, Charles J., 1, Near New Market,1st Manchesters, Pte. Killed Dec. 23, 1914. HUGHES, William G., 4, St. Anne's-road, 6th Cameron Highlanders, L/Cpl. Killed July 23, 1918. HUTLEY, Frederick, 14, Kilbrack-road, 12th Royal Sussex, Pte. W. Killed June 3, 1916. INGATE, Harry, 17, Blyburgate, Australian Imperial Force, Pte. Died April, 1916. JACKSON, Hamilton R., Thatched house, R. A.S.C., 2nd Lt. Killed July 26, 1917. JEFFERY, John A., 8, New Market, 23rd Londons, Pte. Died of W.. April 19, 1915. JOHNSON, Thomas Pelham, Stratford Cott., R.A.S.C., Lt.-Col. M.D.4, D.S.O., Le Mer.Agric. Died June 12, 1918. JONES, Walter T., 41, Alexandra-road, 9th Essex, L/Cpl Killed April 5, 1918. JORDAN, Ernest W., 80. Northgate, 26th Australian Imperial Force, Pte. Died of W.. Aug. 3, 1916. JUDGE, Alexander W., 6, Denmark-road, 1/6 Suffolks (Cyclists), Cpl. Died Feb. 25, 1915. KEABLE, Joseph, 57, Northgate, H.M.S. Aboukir, 1st Class Stoker. Killed Sept. 22, 1914. *KEARNS, Peter, Avondale,Waveney-rd, H.M. Hosp. Ship Garth Castle, Stew. W. Died July 3, 1918. KING, Albert E., Blyburgate, R.A.M.C., Pte. Died of W.. March 21, 1918. KIRBY, Walter E., 43, Ingate, Leinsters, Pte. Died April 9, 1918. KNIGHTS, Jack K., 18, Puddingmoor, 1/5 Suffolks, Pte. Died of W.. April 22, 1917. KNIGHTS, William M., 18, Puddingmoor, 2/1 Oxford and Bucks L.L, Pte. Killed July 19, 1916. LARK, Frederick W., 13, Puddingmoor, Royal West Kents, Cpl. Killed July 18, 1917. LARKE, Leslie T., 7, Puddingmoor, 7th Suffolks, Pte. Killed Oct. 12, 1917. LAWS, Frank A., 2, St. George's-road, 11th Australian Imp. Force, Pte. Killed May 15, 1915. LAWS, Frederick W., 2, St. George's-road, 2nd Suffolks, Pte. Killed April 11, 1917. LAWS, George B., 73, Denmark-road, 22nd Northumb. Fusiliers, Pte. Killed March 21, 1918. LAWS, William G., 3, Blyburgate, R.G.A., Gnr. Died Aug. 29, 1918. LAWSON, Alfred G., 12, Waveney Valley Cottages, R.G.A., Gnr. Killed April 24, 1918. LEON, Ernest, 54, Denmark-road, East Yorks, Pte. Killed Nov. 13, 1916. LEON, Harry, 1, Queen's-road, 9th Essex, Pte. W. Killed April 7, 1918. LEWELL, Leslie E., Ivy House, Old Mill-terrace, 15th Suffolks, Sergt. Killed March 9, 1918. LIST, Charles H., 37, Alexandra-road, 4th Bedfords, Sergt. Killed Feb. 11, 1917. *MARTIN, Edwin S., 22, Fair Close, R.F.A., Shoeing Smith. 1918. MAYES, Frederick, 62, Ingate, Londons, Pte. W. Killed April 23, 1918. MILLS, Herbert E., 10, Ballygate, Manchesters, Pte. Died of W.. Nov. 10, 1918. MOBBS, Herbert A., 5, St. Mary's-road, l.3th Essex, Pte. Killed Nov. 30, 1917. MOBBS, John C., 5, St. Mary's-road, 8th Suffolks, L/Cpl. Killed May 14, 1917. MOBBS, Sidney, 93, Denmark-road, R.F.A., Gnr. Died Nov. 6, 1918. NORMAN, Reginald W., 13, Ingate, 1/4 Welsh, Pte. Died of W.. Jan. 3, 1918. OXBOROUGH, Frank S., 64, Blyburgate, 7th Suffolks, Cpl. Died of W.. Sept. 14, 1917. OXBOROUGH, James E., 22, Old Mill-terrace, 9th Roy. Scots, L/Cpl. W. Killed April 12, 1918. PARNELL, Albert J., Newgate, 1/4 Suffolks, Pte. Killed 1916. PARR, Reginald W. H., 82, Denmark-road, K.R.R.C., Rifleman. Died of W.. Nov. 19, 1917. PARR, William G., 5, Cliff Cottages, 12th East Surreys, Pte. Died of W.. Oct. 15, 1918. PAYNE, Edward L., 1, Hungate-lane, 2nd Norfolks, Pte. Died of W.. Nov. 28, 1915. PAYNE, Henry E., 1, Hungate-lane, R.F.A., Bomb. Killed Sept. 25, 1915. PEACHEY, Frederick W., 20, London-road, R.F.A., Sergt. M.D. 1914 Star. Killed Sept. 9, 1917. PEARL, Sidney R., 9, Swines green, 19th Middlesex, Pte. Killed Sept. 6, 1918. PELLS, C. Elimore, Rookwood, 2nd Devons, 2nd Lt. Killed May 25, 1918. PENMAN, Arnold, 65, Denmark-road, 9th Suffolks, Pte. Died of W.. Feb. 26, 1916. PIPE, Edwin G., 9, Queen's-road, 2/4 Ox. and Bucks L.I., L/Cpl. Killed Sept. 10, 1917. PIPE, Percy D., 9, Queen's-road, 2/4 Ox. and Bucks L.I., Pte. Killed March 29, 1918. PIPE, Robert H., 9, Queen's-road, 2/4 Ox. and Bucks L.I., Sergt. Died of W.. Mar. 29, 1918. PIPE, William J., 9, Queen's-road, Hon. A.C., Inf. Batt., Pte. Killed May 3, 1917. PIPE, Samuel J., 3, Fen-lane, 19th Middlesex, Pte. Killed Oct. 25, 1917. PIPE, William, Brickyard, Ingate, 21st Manchesters, Pte. Killed June, 1916. PLEASANTS, Charles A., 54, Puddingmoor, 14th Hants, Pte. Killed Oct. 5, 1916. PLEASANTS, Henry A., 54, Puddingmoor, City of London, Pte. Killed Oct. 30, 1917. PLEASANTS, Thomas, 54, Puddingmoor, Lab. Corps, Pte. Killed (acc.) March 28, 1918. PLEASANTS, William, 54, Puddingmoor, 8th Suffolks, Pte. Killed May 5, 1917. POLL, Arthur S., 17, Douglas-place, 15th Suffolk, Pte. Killed Sept. 23, 1918. PRIME, Walter, 9, Knights'-yard, Ravensmeer, 1/4 Suffolks, Pte. Killed April 25, 1918. PURLAND, Alfred S., 3, Dacre-place, 1/5 Suffolks, Pte. Killed Nov. 2, 1917. RACKHAM, Albert J., 40, Denmark-road, 7th Suffolks, L/Sergt. Killed Oct. 13, 1915. *RACKHAM, Herbert J., 75, Denmark-road, 6th R. W. Surreys, Pte. W. Died Oct. 31, 1918. READ, Archie, Gresham House, Smallgate, R.A.M.C., Pte. Died of W.. April 7, 1918. READ, William, St. George's-road, 1st East Kents, Pte. Killed July 1, 1918. REEDER, Thomas C., 64, Denmark-road, 7th Norfolks, C.S.M. Killed Oct. 12, 1916. RICHARDSON, Herbert A., 32, Upper Grange-rd., 1st Tynsde. Sc. North'd. Fus., Pte. Died of W.. Oct. 20, 1917. *RICHES, Arthur C., 29, Blyburgate, R.F.A., Dr. Died Oct. 6, 1915. ROBINSON, Lionel W., 37, Ballygate, 6th Bedfords, Sergt. Killed July 15, 1916. ROE, Archibald G., 53, Caxton-road, 1/6 Suffolks (Cyclists), Sergt. Died Oct. 23, 1915. ROE, Harold A., 22, Ballygate, 1/5 Suffolks, Pte. Died April 30, 1915. ROE, James, 14, Old Mill-terrace, 9th Suffolks, Pte. Killed Sept. 16, 1916. ROGERS, Frederick, 1, Harbourage, 1st Dorsets, Sergt. 1914 Star. W. 5. Died of W.. July 12, 1917. ROOFE, Matthew, 1, Wash-lane, Cambridge Regt., Pte. Killed April 14, 1917. ROWSELL, Herbert G., The Rectory, 14th Hants, Capt. Killed Sept. 3, 1916. RUSH, Frederick, Ravensmeer Cottage, 9th Norfolks, L/Cpl. Killed Sept. 15, 1916. *SAKER, Charles R., 54, Ingate, H.M.D. Canopus, Deck Hand. Died Feb. 25, 1919. SALTER, Harry E., Swines-green, 9th Suffolks, Pte. Killed April 22, 1917. SAMPSON, Frederick J., 3, Gosford-road, H.M.S. Pathfinder, 1st Cl. Stkr. Blown up Sept. 5, 1914. SAMPSON, James, 22, Old Mill-terrace, 2nd Norfolks, Pte. Died of W.. Sept., 1915. SAMPSON, Robert, 2, Shelton-place, Royal West Kents, Pte. Died of W.. July 26, 1916. SANDY, Ernest. Ellough-road, East Surreys, Pte. W. 3 and G. Killed May 20, 1918. SARBUTT, Albert, 5, Old hill-terrace, 1/4 Suffolks, L/Cpl. Killed May 14, 1916. SAUNDERS, Charles, 3. St. George's-road, West Yorks, 2nd Lt. Killed July 1, 1916. *SCREATON, John R., 70, Northgate, Royal Irish Fusiliers, Pte. Died Feb. 13, 1919. SEAGO, Frederick William, 5, Pleasant-place, 5th Northumb. Fus., Pte. Killed Aug. 26, 1914. SELF, Johnson T., Ellough-road Farm, 2nd Suffolks, Pte. W. Killed Sept. 27, 1917. SELF, Reginald, Rigbone-hill, Australian Imp. Force, Pte. Died Aug. 5, 1916. SHIPLEE, Alfred, New Market, K.R.R.C., Rflmn. Killed June 6, 1917. SHIPLEE, James D., New Market, 2nd Royal Berks, Pte. Died of W.. Dec. 6, 1917. *SIMMONDS, Edward, 37, Queen's-road, 1916, R.G.A., Gnr. Died of W.. June 29, 1918. SIMMONS, Francis W., 10, St. George's-road, 1/5 Suffolks, Pte. Killed Oct. 2, 1917. SMITH, Arthur St. C., 4, St. Anne's-road, 2nd City of Londons, Pte. Died of W.. Sept. 16, 1916. SMITH, Ernest W. F., 17, Puddingmoor, 1/5 Suffolks, Pte. W. Killed Nov. 2, 1917. SMITH, Sydney E. D., Cameron House, London Irish Rifles, Cpl. Killed May 22, 1916. SMITH, William, 7, Ingate, 3rd Canadians, Pte. Killed Oct. 8, 1916. SNELL, Edward W., 15, St. George's-road, 1/5 Suffolks, L/Cpl. Killed Aug. 21, 1915. SOANES, Frederick, Common Farm, 7th Royal Fusiliers, Pte. Killed Nov. 13, 1916. SOANES, George W., 2, Peddars-lane, 7th Northants, Pte. Killed Sept. 21, 1918. SOANES, William, Ingate-place, 1915, South African Inf., Pte. Died of W.. April 15, 1917. SPALDING, Charles, 2, Kemp's-lane, 8th Suffolks, Pte. W. Killed Oct. 12, 1917. SPEARE, William S., 30, Gosford-road, Royal West Surreys, Pte. Killed Nov. 21, 1916. SPORNE, Walter, 30, Newgate, , 75th Canadians, L/Cpl. Killed Sept. 30, 1918. STIMPSON, Edwin R., 41, Ingate-road, 7th Suffolks, Cpl. Died of W.. Feb. 29, 1916. STONE, George W., 7, Hungate-lane, 7th Suffolks, Pte. Killed July 3, 1916. SUTTON, Walter, 145, Denmark-road, R.A.M.C. (F.A. ), Pte. Blown up, Aug. 14, 1918. TAYLOR, Arthur, " Black Boy," Blyburgate, R.A.S.C., Dr. Died July 20, 1916. TAYLOR, Percy D., 8, Queen's-road, Grenadier Guards, Pte. W. Killed May 27, 1918. THORLEY, John, 32, Ravensmeer East, R.F.A., Gnr. Died Sept. 7, 1917. THORPE, Frederick P., 16, Lady's-meadow, R.E., R.O.D., Spr. Died May 8, 1919. *THORPE, William H., 16, Lady's-meadow, R.F.A., Cpl. Died March 1, 1917. THURLING, Ralph W., 2, New Market, 1st Norfolks, Pte. Killed Sept. 4, 1916. *TOOK, Cyril A., Fairholme, Waveney-rd, 12th Suffolks, 2nd Lt. 1915 Star. W.2. Died Aug. 14, 1919. TORBELL, Stanley E., 23, Alexandra-road, Rifle Brigade, Rflmn. Died of W.. May 4, 1918. TOWNSEND, George J., 4, Caxton-road, 7th Suffolks, Cpl. Died of W.. April, 1918. TURNER, George F., 11, Old Mill-terrace, 22nd Londons, Pte. Killed March 31, 1918. WALPOLE, Olley, 3, Stepping-hi11, Canad. Cycle Corps, Cpl. M.M., 1914 Star. Killed Oct. 11, 1918. WARD, James W., 32, Gosford-road, R.E., Spr. Died Aug., 1915. WARD, John M, 34, Fair Close-road, 2nd Suffolks, L/Cpl. Died Jan. 10, 1917. WARD, Percy, 47, Caxton-road, R.E., Spr. W. Drowned (at Arras) May 21, 1917. WARNES, Ambrose J., 1, Nelson-yard, 7th Norfolks, Pte. Killed Oct. 14, 1917. *WATERS, William Burgoine, 17, Douglas-place, 1st Norfolks, Sergt. W. and G. Died of W.. May 21, 1917. WIGGETT, William H., 14, Queen's-road, R.E., Spr. W. Died of W.. March 22, 1918. WILKINSON, Eric F., Ashman's-road, Mach. Gun Corps, Pte. Died (whilst Pris.) June 9, 1918. *WILSON, Herbert, 19, Pound-road, R.F.A., Gnr. Died Nov. 27, 1915. WINTER, Albert J., 2, Shaw's-yard, 1/5 Suffolks, Pte. Killed Oct. 3, 1915. WRIGHT, Reginald G., Council School-yard, 7th Suffolks, Pte. Killed July 3, 1916. YOUNGS, Robert W., 28, Denmark-road, 1st Northd. Fus., L/Cpl. 1914 Star. Died of W.. Sept. 29, 1918. For more information, please see David Lindley's website here. Thanks very much Brett. I really appreciate all your support.